Any producer will tell you that they monitor their mixes through several different sources, be that with a pair of nearfield monitors, a Bluetooth speaker, through a car stereo, or on a pair of headphones. Getting the right pair of headphones is as a personal choice as you can get when buying studio gear. You may want a pair solely for mixing purposes, some may want something that can cope with everyday music-listening duties, while others want a pair of cans sturdy enough to cope with life on the road. Whether you’re a DJ, someone who likes to make music away from their studio or just appreciate listening to good quality audio, one thing is certain, quality is key. What you need, then, is a round-up of headphones from some of the best-renowned manufacturers in the market, with reviews that tell you their strengths and weaknesses and discuss their suitability for different musical disciplines. Well look no further as that is exactly what we have for you right here. Read on for the best monitor headphones for producers. Whether you’re a beginner or a pro, there’s something for everyone. 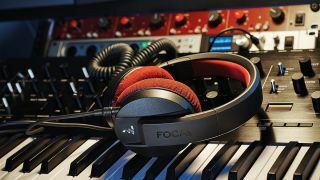 The Focal Listen Professionals, are exactly what they say on the tin; ideal for both listening and pro duties that we’d put them firmly in the all-rounder category. Overall, the fit is snug, but not too tight that long periods in the mixing saddle are unbearable. In fact far from it, the longest period of time we had them on was for around three hours, with the main issues just being back pain and the lack of blinking. While many engineers and audio specialists much prefer open-backed designs for their lack of fatigue, the closed Listen Pros perform admirably in this regard. At this price and above we've used models with more apparent 'air', but we don't consider this a deficiency, and it means there's no settling for a dull mix. Down the other end the response is no less smooth with all the extension you need without the slightest hint of boom or false fatness. Moving up, the low mids continue unwrinkled, free from cheap scooping back (a voicing often employed to mask uneven response) so you can really hear what's going on, for better or for worse. It's all about the mids and low mids for us, and with the R70x all the juice comes through without complications; everything appears clearly delineated and unmuddled, unless the source is otherwise. The DT 1770s are exceedingly well balanced across the audible spectrum. The mid range is free from audible phase shift, allowing the clarity essential for professional use. The sound stage projected into your head is as pleasurable as it is revealing. They provide a highly detailed view into your audio, from left to right, front to back, and even into the corners! From discrete reverb tails tucked behind a busy mid range, to tiny distortions and clips, they reproduce whatever your signal chain is capable of supplying. Audio restoration, mixing and tracking all greatly benefit from the quality the DT 1770s offer. Headphones can be a good way to judge bass when the available monitors don't reach down too far, and in this regard the HRM-7s don't disappoint. There's no hyping, just a clear picture of what's going on down low. The low-mid and mid range are crucial for the real meat in any mix, and it can be easy to make a mess here without decent monitoring. The HRM-7s present the detail in this range accurately; no carving out or pushing forward which are often the side effects of bass-hyped or bass light designs (respectively). The airy top, ie 15kHz and up, is all present and correct so you can control the 'twinkle' without second guessing. The upper mid/early high range ( 5kHz) is a little overrepresented for our taste, which makes us mix this region too far back. The reissued M50 ('x’ = detachable cable) is a popular model across the audio world, competing directly with Beyerdynamic and AKG. They are comfortable, fold and bend in all the right places, and are relatively light (285g). The sound quality is good overall, though they do shy away from a detailed, airy HF region. The mids are clear and forward, while the bottom-end extends down without any peaky resonances. As with all the low impedance designs here (38 ohm), they are easily driven beyond our comfort threshold. With the Flares Pro, Flare Audio have gone back to fundamentals, designing a titanium earpiece module that’s coupled with one of three user-selected and fitted ear foams. Each ear foam design (audiophile, universal and everyday) offers slightly different sonics, durability and comfort, and comes in three sizes for a snug fit. Bluetooth use requires you to plug up the clip-on mini module, and this includes three multi function buttons to access the typical start/stop, volume and track advance options. Sonically the Flares are the some of most precise in-ear phones we've heard, although they are a bit bright for those who like to crank up the volume, it’s obvious why they’ve picked up endorsements from top producers. There’s almost no point us telling you ‘how well they sound’, as they’re going to sound great to you, no matter what. The profiling is voiced in a such a way to sound very pleasing, with a crisp and detailed top-end, slightly scooped mids and haptic drivers that deliver more than enough low-end to offer plenty of depth and immersion. Of course how this is achieved differs with each user, but stacked up against other headphones at a similar price point, they perform admirably. You may find yourself going back over old mixes and making some tweaks. Even though the Nuraphones fit firmly into the ‘listening’ category of headphones, they do prove useful as an alternative monitoring source in the studio. Perfect for those hasty club mixes if you're missing a sub-woofer in your speaker setup. The MP-240 uses a dynamic driver for bass and a balanced armature for the mids and highs (Mackie call it a dual hybrid design), and although this model isn’t substantially more expensive than the MP-220, we feel it’s streets ahead sonically. First up, the mid range is more defined yet overall feels less prominent, which should be less fatiguing. However, it’s the top end where these really win, with clear yet smooth high frequencies delivering excellent articulation. Indeed, switching back over to the MP-220 only goes to hammer home how much better the MP-240 sounds. Noontec’s Hammo Wireless is the cheapest wireless headphone here, but these are very decent cans irrespective of price. Bluetooth setup is simple, as is getting to grips with the three multifunction buttons. The bundle includes a semi rigid carry case and there are also cables for USB charging and wired use. In terms of comfort, these are the least invasive of our four and, although this means isolation isn’t the best, the light design is very comfortable – great for extended listening, as is the 50 hour battery life. Sonically, the Hammo is reasonably upfront with well-tamed bass and excellent high frequencies. It’s hard to imagine IEMs delivering a sound you can rely on for production duties, be it tracking, sound design or mixing, but the E70s impress from top to bottom. They don’t quite rival an equal price set of headphones, especially in the bass, a region in which physics throws up some serious constraints. Subs are audible and there’s no low mid scooping to mask poor phase response; the bass is just less punchy than my studio headphones. The mids are clear and free from fatiguing peaks, so the meat of a mix can be tackled with confidence. The high frequency range is slightly soft in comparison to my main cans, but our hearing quickly adjusted and we were happy using EQ in this region; subtle adjustments come through clearly.